Well it’s appropriate to base this week’s tips on the exciting deluge of rain we have experience in the past week or so. Rainfall totals in the Tweed and Gold Coast river catchments have been impressive. It did keep us off the water during the heavy rain and we have had to reschedule a number of charters on both boats. The upside is the fishing will really fire up in the coming weeks and months, with many systems given a beautiful flush out and rejuvenated. It does come as a relief as we had been in a dry pattern for quite a while, and with El Nino conditions in place currently, the months ahead look dry too. 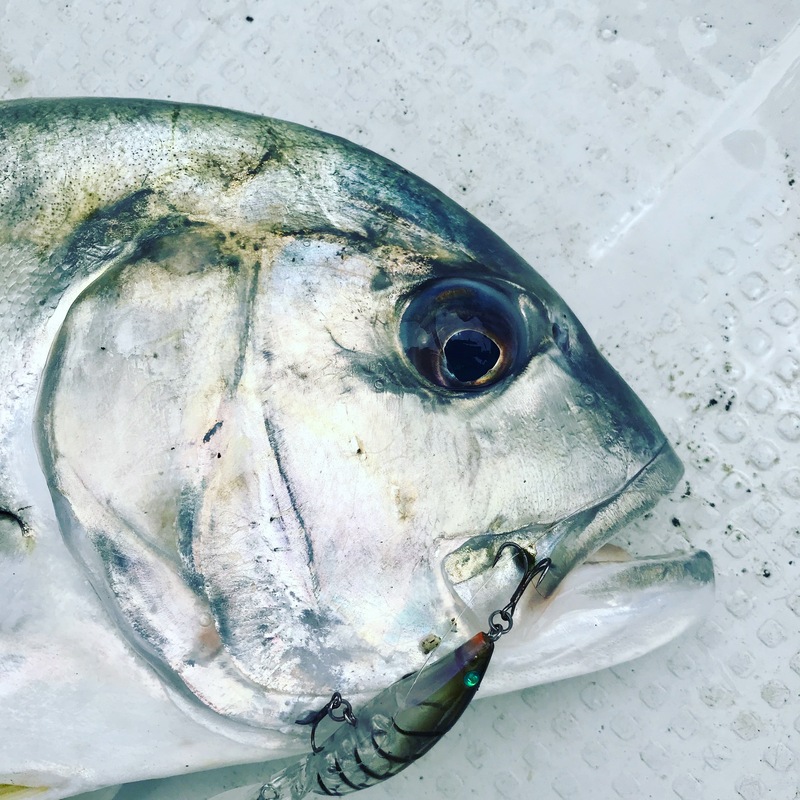 We can look forward to a good few months however, especially with summer species including mangrove jacks, big summer whiting, hard fighting trevally, and solid tuskfish in the broadwater. 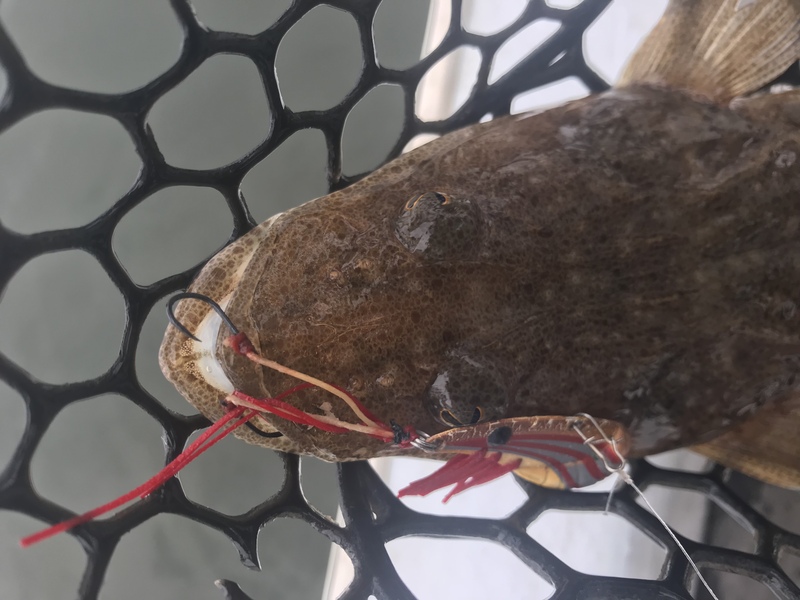 The mud will bring on some big flathead too. At the moment it’s best to focus your efforts near where dirty water meets clean in creeks and rivers that had big rain. It’s also worth trying in places that weren’t affected by catchments. For example lakes and canals away from the main river streams. It can also pay to fish rivers on a run in tide to find the saltier water that estuary species prefer to feed in. The seaway and broadwater is a good option this weekend because of the influx of cleaner ocean water. Try using yabbies which work really well in dirty water, as do other baits and lures with some smell such as Gulps. Use lures that are bright coloured or have dark/ bright contrast to stand out in the water and catch the fish’s eye. Gold and shiny colours often stand out. As mentioned our trips were curtailed this week due to strong wind and heavy rain. Brad is back on the water at the time of writing today. 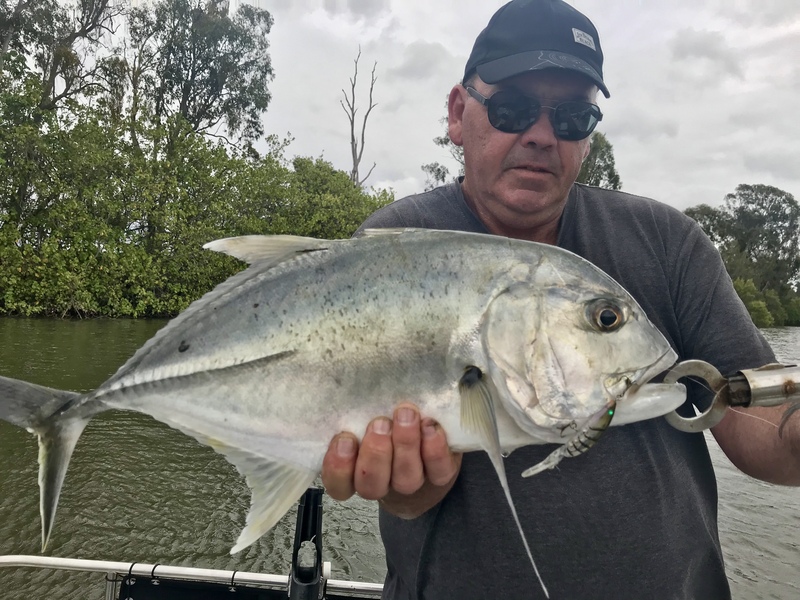 Before the rain came Brad was starting to get good results with surface fishing for whiting at the Chinderah section of Tweed river, plus the usual daily catch of school size Dusky flathead, and trevally starting to show up. 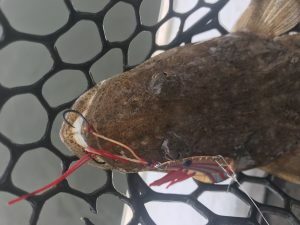 At the Broadwater and Nerang river Clint had some fun days with flathead on lures. 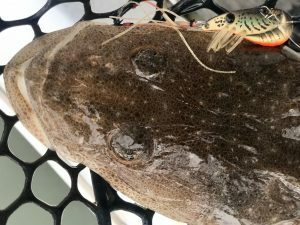 On Friday Iain was visiting from Port Macquarie, we picked him up by boat in the middle of Surfers paradise and had a productive session with 10 flathead on his solo charter, mostly around the 45cm mark and all released. 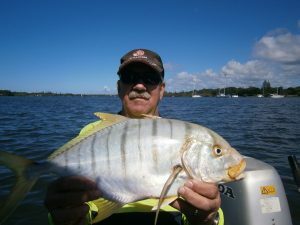 The highlight of the day was his epic battle 20 minute battle on light tackle with a solid Giant Trevally. 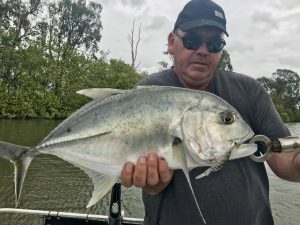 The fish hit his Savage Gear 3D shrimp xdr lure at a million miles and hour, nearly spooled us on the first blistering run, then ran us under pontoons then across the river into the mangroves. Iain did extremely well to get the fish out and into the net for some photos before releasing it to swim off powerfully. 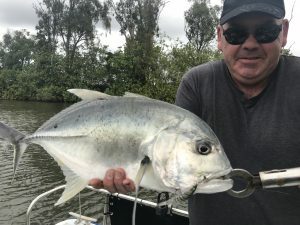 So we look forward to getting out heaps in the coming week for some improved weather and great fishing. From now on until May next year we’ll aim to start each day trying for big Mangrove jacks with lures before we move on to the estuary species.